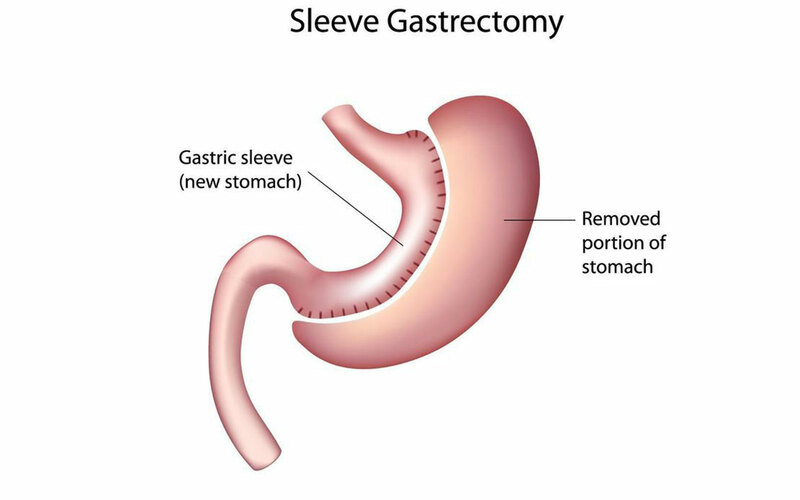 Sleeve Gastrectomy is an irreversible weight loss procedure in which the stomach is divided into two partitions, creating a new stomach out of the smaller left part with laparoscopic surgery or vertical sleeve gastrectomy. Like other metabolic surgeries, it also promotes weight loss by changing hormonal signals between the stomach, brain, and liver to establish a lower set point. 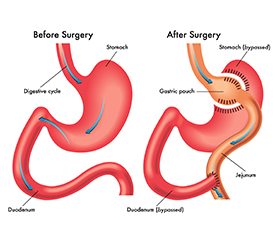 In comparison, a full Gastric Bypass surgery consists of two stages, the first being the Sleeve Gastrectomy division and the second the Roux-en-Y end-to-side procedure, which is done to re-route and reconnect the intestines. 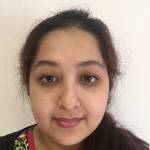 However, Sleeve Gastrectomy surgery can be completed as a standalone weight loss procedure. Bariatric and metabolic surgery has a mortality rate of 0.13 percent. This means that out of 10,000 people who have this kind of surgery, on average 9,987 will survive surgery and 13 will not. BMI measuring in excess of 34. Evidence of historic weight loss attempts without a successful outcome. 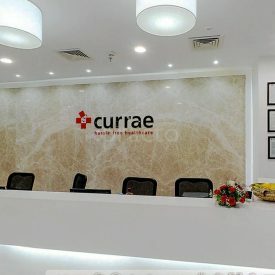 Commitment to addressing obesity and medical conditions through a medically supervised programme, which includes surgery, dietary, lifestyle and behavioral changes. Responsibility for learning to control weight through health management. Understanding benefits, risks, and complications associated with weight loss surgery. Patients are hospitalized and given general anesthesia prior to LSG or VSG. 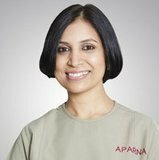 The surgeon makes small incisions in the abdomen-to-stomach area for insertion of a laparoscope, to provide visuals of the stomach area to be operated on. The surgical division of the stomach can either be done via the laparoscope or through an open surgery, in which the surgeon operates through a larger half-inch open incision in the stomach. Ghrelin hormones are removed with surgical instruments via the incision, which is present in a certain part of the stomach. While the left side of the stomach is sectioned off with staples to create a smaller stomach. The sphincter muscles in the upper and lower stomach are retained, and the new stomach, reduced between 45 to 75 percent, is tubular shaped. Upon completion of the surgery, the surgeon uses dissolving sutures and sterile tape to seal the incision site, to allow for healing. During surgery, your surgeon will make between 1 and 5 small incisions in your abdomen (which minimizes gastric sleeve scars), insert various laparoscopic instruments, and remove about 80% of your stomach. A banana-shaped “sleeve” will be created that connects the esophagus to the small intestines. Your much smaller stomach will because you feel full sooner and result in long-term weight loss. It is done laparoscopically in one to two hours. 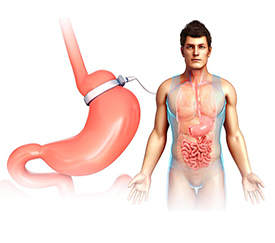 The gastric sleeve procedure is done for patients of all ages, from juvenile to the elderly. Long-term remission of type 2 diabetes. Pouch stretching. The stomach gets bigger over time, stretching back to its original size. Breakdown of staple lines. The staples fall apart. Nutritional, vitamin, and mineral deficiencies. Your body will be less able to get nutrients from food. Stomal stenosis. A narrowing form of the connection of the stomach and small intestine causing nausea, vomiting, reflux, and then an inability to eat. This will need to be dilated. 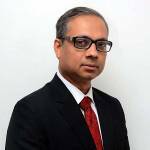 About 1 in every 5 patients experience Gastroesophageal reflux disease (GERD) in the first 12 months.GERD is a highly variable chronic condition that is characterized by periodic episodes of gastroesophageal reflux and usually accompanied by heartburn. For most obese patients, the skin has been stretched out for so long to accommodate the extra weight that it has lost its elasticity. Gastric sleeve surgery causes most patients to lose a lot of weight very quickly, and your skin simply can’t keep up. After two years, about 1 out of 20 gastric sleeve patients have gained back some weight from their low point. That number increases to 3 out of every 4 patients after 6 years. The operation is carried out to reduce the size of your stomach. General will be given to the patient before this surgery. It is a pain-free process and you will be asleep. 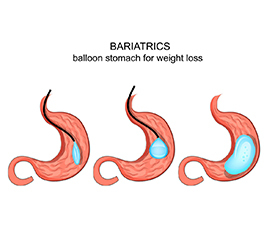 The Intragastric Balloon, also known as Gastric Balloon Surgery is a non-surgical, temporary weight loss treatment for obesity, in which a high quality and durable silicone bag.